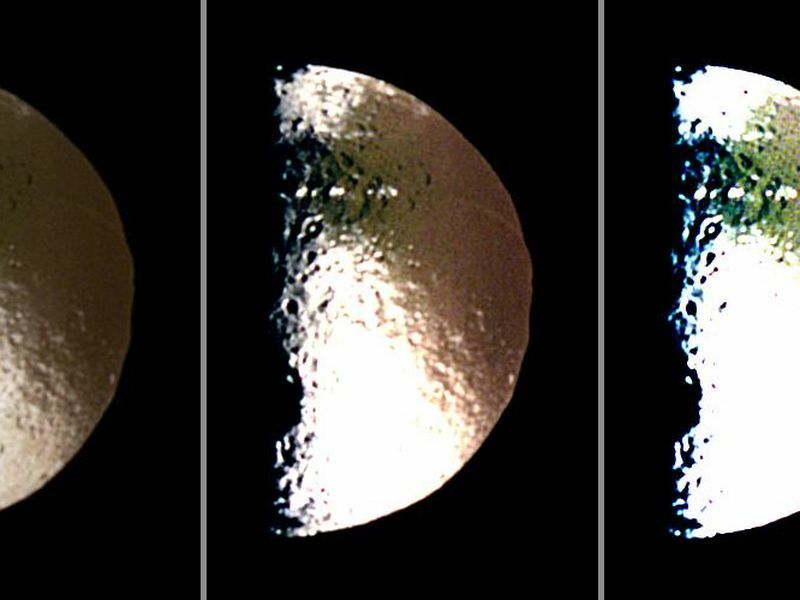 Three different false-color views of Saturn's moon Iapetus show the boundary of the global "color dichotomy" on the hemisphere of this moon facing away from Saturn. 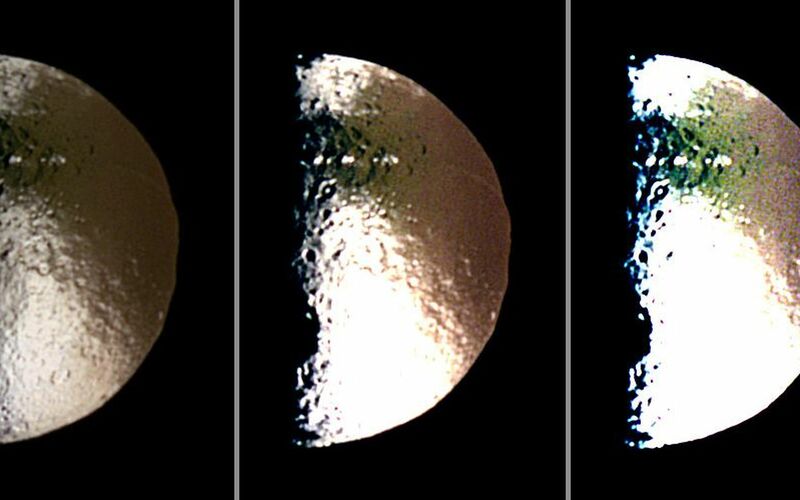 The "color dichotomy," which has been detected in images from the Cassini imaging team, is a second global pattern found on Iapetus besides the well-known global brightness dichotomy. This image consists of three panels, each of which was contrast-enhanced in different ways to bring out surface features. Minimal enhancement was applied to the image on the left panel while those on the middle and right panels were enhanced more (with contrast increased by factors of two and four, respectively), making them appear brighter and overexposed. In the case of Iapetus' brightness dichotomy, the dark terrain extends towards the satellite's trailing side at equatorial regions, and the bright terrain extends towards the satellite's leading side in the polar regions (see PIA11116). In the case of the color dichotomy seen here, its boundary is quite well correlated with the boundary between the moon's leading and the trailing hemispheres. At near-infrared wavelengths, the bright terrain on the leading side is redder than on the trailing side. This pattern is visible in the panel on the left, which uses normal contrast enhancement. The characteristic reddish distribution also appears on the dark material, as seen in the middle and right-hand panels that have been adjusted with even higher contrast. Indeed, the otherwise uniformly dark material shows different color hues, depending on whether the viewer looks at the leading vs. the trailing side. 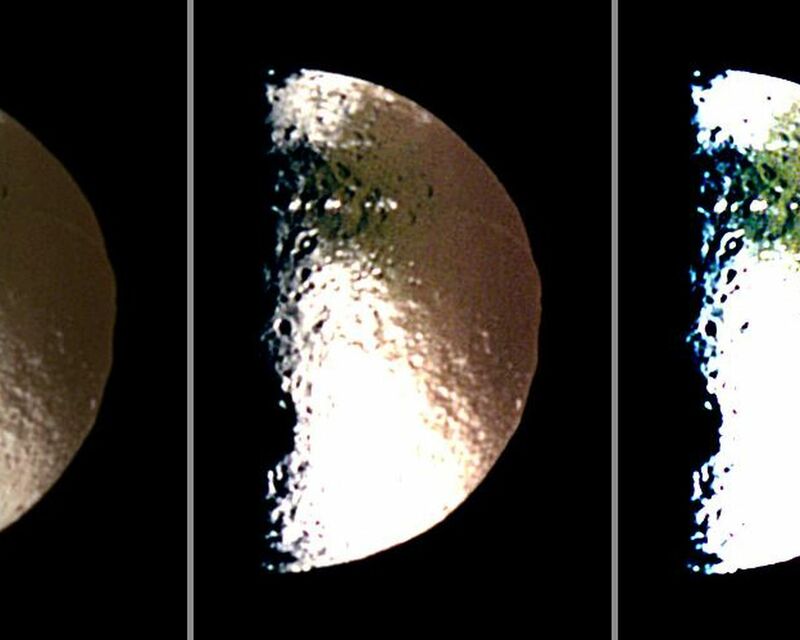 Cassini scientists think this effect is caused by material falling onto Iapetus from the outer irregular moons of Saturn. See PIA06145 to learn more. Images obtained with infrared, green and ultraviolet spectral filters (centered at 953, 563 and 338 nanometers, respectively) were combined to create these false color views. The color seen here is similar to that produced in (red, green and blue) natural color views. North on Iapetus is approximately up in these images. 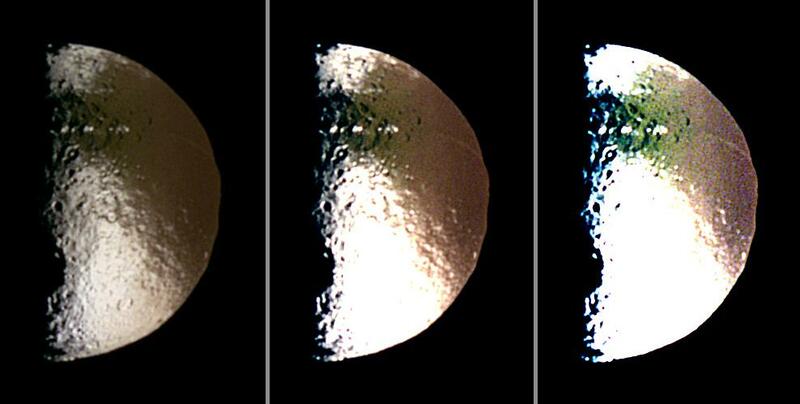 The images were taken with the Cassini spacecraft narrow-angle camera on Oct. 15, 2004. The view was obtained at a distance of approximately 1.2 million kilometers (746,000 miles) from Iapetus and at a Sun-Iapetus-spacecraft, or phase, angle of 88 degrees. Image scale is 7 kilometers (4 miles) per pixel. The diameter of Iapetus is 1,471 kilometers (914 miles).